Sugar! 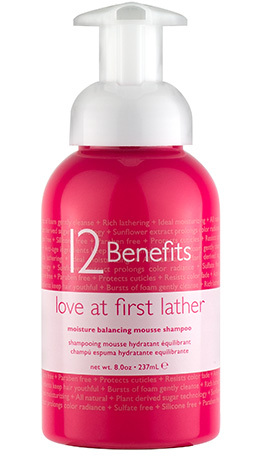 This is what we use to clean your hair in our new generation shampoo, 12 Benefits™ Love At First Lather. Our innovative foaming sugar shampoo washes hair with natural plant sugar and coconut oils and contains only 9 essential good-for-you ingredients. No harsh detergents allowed! Unlike every other shampoo you’ve seen, Love at First Lather does not require the typical “scrubbing” action that produces lather. * A non-aggressive massage with your fingertips activates our ultra-rich foam wash and immediately suspends perspiration and scalp oils, leaving hair both clean and in ideal condition. Better for your hair. Without excessive friction and detergents, cuticles are left undisturbed, the scalp does not become dry, and your color radiance is preserved. This is critically important after haircolor treatments or highlights, chemically straightened hair, curly hair, or hair that suffers cuticle damage due to frequent use of heat (blowouts, hot ironing). Our modern generation shampoo foam is 35% – 50% more concentrated, free of salt, sulfates, parabens, and silicone. And, we use sunflower extract (a natural sunscreen) to prolong your haircolor. *Lather is necessary to suspend, rinse, and wash away perspiration and scalp oils. If your hair texture is fine and you usually need more oomph for your hair, rinse Love At First Lather a little longer than usual with warm water for major volume in your fine hair.